Very nice, gated facility. Easy to log in and pay without having to go to an office! most storage units I have rented are musty and leak. I like the fact that these units are clean and new. the location is convenient at the top of the hill North of town. 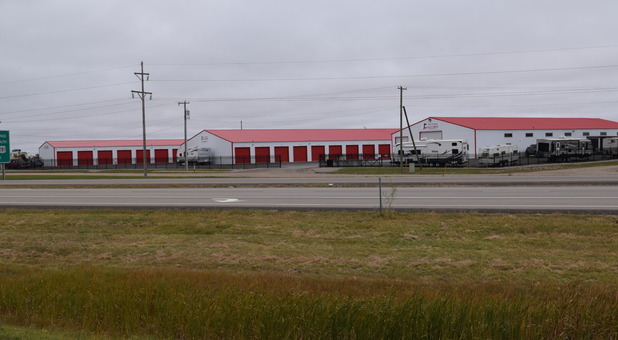 Convenient self serve storage right off the highway and not far from fairgrounds, gated and easy to rent online. Excellent clean and convenient storage . Staff are top notch and always kind and helpful ! Great facilities for a great price. Some of the best customer service I've ever dealt with, such kind people. Would highly recommend! Great staff both inside and outside. Snow removed quickly, even had the do direct removal from in front of door. Glad I have my rental there! RH Rebel Storage, I rented a large space for my goods and car approx. a year ago. The facility and the space was impressive in size and cleanliness. I found it was extremely easy to deal with the rental folks and they made it even easier for me to make monthly payments. I choose my own locks and codes making access great. They even have brooms, pallets, shovels and dollies available to help make the moving of items easy and keeping the space tidy. Every time I go there the facility is clean and tidy and employees are making the rounds, keeping the place safe. I have not experienced any rudeness there, nobody blocking the access or playing loud music by spending excess time there. After all, its a rental area not a hideout or adult play area for parties, drinking or working. I recommend RH Rebel Storage for anyone in need of a safe and clean place for your storage needs. I absolutely love Rebel storage. First, the employees go above and beyond. The convience of renting and maintaining my storage facility fits with my needs. If I could give Red Headed Rebel 10 stars, I would. Thank you to a great team!! Well done. Customer Service was great, facility was clean and secure. Great, well-managed facility and great customer service! We used a 12x30 Unit for storage while we relocated to Billings, MT. Excellent location and was so convenient for the lease purchase, check in, and transitioning out of use. Will recommend the Units to anyone who asks. Thank you RH Rebel Storage -- you have made our move from SD to Jamestown so very easy. I always felt safe going to my storage unit. Thank you Thank you Thank you. I will definitely recommend your facility to anyone looking. Thank you again for your great service. The facility is clean and everyone is friendly and helpful. The facility is kept clean and nice. Everyone is friendly and helpful. When rain got into the building where my unit is located they called me so I could go and check to make sure none of the things I have stored there were damaged. I appreciated it very much. I was able to rent a unit online after business hours and it was very easy! When I had to switch units because I didn't rent one big enough, the staff were very friendly and easy to work with. The units are nice and the secured area is clean and easy to navigate. Very easy to work with. This place is very well taken care of. The paving looks awesome. The management is accessible and helpful and the online paying is convenient and works very well. Easy in and out access spacious units. Would recommend to all my friends. Very nice storage facility and I like that it's fenced in and has security. Storage staff is very easy to work with. Scott and his staff are great to work with, and offer a first class storage facility! Douglas was so friendly & helpful. Great location very clean love it! This place is really cool. Personal units, regular units and even RV storage units with electricity. Wow.